Summary of today’s show: Fr. Andrew Small, national director of the Pontifical Mission Societies, and Fr. Rodney Copp, Boston director, talk to Scot about World Mission Sunday and how the societies provide support for the Church in 1,100 mission dioceses worldwide; how the US went from being a major recipient of aid to being the largest donor in two centuries; and how the “pagan babies” served by the societies years ago still need our generous assistance today. 1st segment: Scot welcomed everyone to the show. In three weeks, we will celebrate World Mission Sunday. Scot welcomed Fr. Rodney Copp and Fr. Andrew Small. Scot said Cardinal Richard Cushing once served as Pontifical Missions director in Boston. Fr. Small’s predecessor was Archbishop Fulton Sheen. Fr. Small said it is awesome. Fr. Small has served in many roles in the US. Scot asked him what he has learned new about the missions since being appointed last spring. Fr. Small said this country was a recipient of great gifts supporting the missions in the US back the 18th century. When faith is planted and watered and grown is bound to spread. It never stops surprising him how generous people are to the missions. Fr. Copp has been in his role since June, 2010. He’s been surprised by the incredible complexity of the the work with regards to the numbers of diocese they serve and how many dioceses are represented by missionaries coming to ask for support. He also had not known of how much support the archdiocese has provided to the missions over the years, being one of the leading dioceses in the US. Boston is the birthplace of Maryknoll, 100 years ago this year, and the the Missionary Society of St. James the Apostle, founded by Cardinal Cushing. Scot said the Oblates of Mary Immaculate (OMI) have a long history of service in the missions. He asked Fr. Small if that was why he entered the missions. Fr. Small said he was born in Liverpool, England, to Irish parents. He came to the US in 1988 to study and got to know many Oblates in Lowell. The second-to-last Sunday in October was always World Missions Sunday. This is the mission of the whole Church and in his boyhood parish where there were OMI priests, on that Sunday they would build igloos to represent their work among the Eskimos/Inuit people. They serve the people who live beyond the end of the asphalt roads. Fr. Small served for a year in Brazil. The OMI in Brazil were asked to serve in a time when they were still mission dependent, i.e. dependent on missionaries. The Church in Brazil is strong in faith, but still having a hard time providing catechists and the sacraments to the people. He served outside Rio de Janeiro near some of the infamous favelas, but among very generous and joyful people. What he learned was that in the drive for progress, the little people are being left behind, especially in faith. The OMIs go to these little people so they are not left unserved, including immigrant communities. There is great hope in the missions, but these people are getting left behind economically, both in our country and around the world. The OMI have as many seminarians as they did in the 60s, but they are in new places like Africa and Asia. If we are missionary, we are energized as a Church. If we lose that global focus, we turn in on ourselves. Fr. Copp said when we heard vocation years ago, we thought of priests and religious, but every baptized Catholic has a vocation which is intimately bound up with the command in Matthew to serve all nations, whether through prayer, contributions, or actually going there. Scott asked what we can do to stay connected to Catholics across the world. Fr. Copp said people should be aware of what’s going on in the media, including Catholic media. Become members of the Society of the Propagation of the Faith and receive the member magazine. He encourages everyone to join them at the cathedral at 11:30 on World Mission Sunday for Mass with Cardinal Seán. Why is World Mission Sunday the second-to-last Sunday of October? It’s always been that Sunday. 2nd segment: In addition to the Society for the Propagation of the Faith, he three other mission societies are Society of St. Peter the Apostle (raises funds for priests and religious), Holy Childhood Association (for children), and Missionary Union of Priests & Religious (provides theological support). As pontifical societies they are tied to the Holy Father. They are in the diocese, they are apart from the diocese. They approach people in the name of the holy Father to ask for support. The local societies report to the national office and from there to the Vatican congregation for the propagation of the faith. In 2010, 27% of the entire support that goes to the 1,100 mission dioceses comes from the United States. We do have a history and a culture of giving and supporting one another. In the beginning of the mission societies, the United States was an equivalent beneficiary of missionary funds. On World Mission Sunday in the US, it raises about $18 million. Scot said in addition to the World Mission Sunday, there are also missionaries who go into parishes to ask for support. Fr. Copp said they provide even more funds to missions, as well as provide specific information on particular missionary activity. Fr. Small said when you have a missionary from India tell you about her work and the people she serves, it tends to elicit more donations. They also receive tremendous donations from those who want to leave a lasting legacy through a donation in their last will & testament. He pointed out that overhead is just 3 or 4% and the rest goes right into the pockets of missionaries who need it. The Holy Childhood Association is working in Africa where there is a massive drought and famine. The Church is always at the sharp end of human crisis in the world and people ‘s gifts recognize. Donations can be made to givetothemissions.org. Fr. Small said the difference between charity and Catholic charity is that you are making a difference for the whole person with eternal consequences. For someone who is provided with AIDS drugs, you can also help them understand the ultimate meaning of their lives. You have to give people the whole package. 3rd segment: Scot asked how the money from the collection gets to the missionaries. Fr. Copp said the parish writes a check to the local Propagation of the Faith and all those 291 checks are collected. They hope that it can all be gathered within a couple of weeks. Last year, it was about $300,000 or $400,000. The national office collects all the checks from the 175+ dioceses in the United States. They total it all up and notify the Congregation for the Evangelization of Peoples. They put it together with what they get from all the other major giving countries. The staff in Rome look at the needs in the 1,100 mission dioceses around the world as well as the request from the 190+ national mission society directors, and put together a proposal for each project. Then all of the national mission societies come together and go through each proposed project, see the special circumstances involved, and then vote on them. Then they disburse the funds. The money doesn’t go out from Rome, but they get a letter to tell them where to send the money in order to maintain accountability. Recipient dioceses send a letter to explain how the funds were spent. Fr. Small said the democratic process is amazing. Even though the US gives so much, it gets one vote among many. The US doesn’t get to tell other people who to run their own Church. Sometimes there is haggling and frustration in the debate, but it’s because the need is so great. Fr. Small said the bishop is the father of the diocese and so when he makes a request it gets special consideration. One request from each diocese must come from a religious community. Fr. Copp said he can see what can be accomplished by looking around at the archdiocese to see how it has grown from a mission diocese. 4th segment: World Mission Sunday will be celebrated at the cathedral as well by Cardinal Seán and missionary priests and bishops in the Archdiocese. The Mass is offered for the repose of the souls of missionaries who died in the field over the past year. They also bless and distribute mission rosaries, asking people to pray for the missions. This was created by Archbishop Fulton Sheen. Many missionary groups are invited to join in the Mass. In the intercessions and readings, they use different languages to represent the Church’s diversity. Cardinal Seán was in the Diocese of Fall River for 12 years before being in Boston. When he was in Capuchin formation, he had planned to go to the missions, but instead he was asked to go to Washington, DC. Yet he still has missionary DNA. Fr. 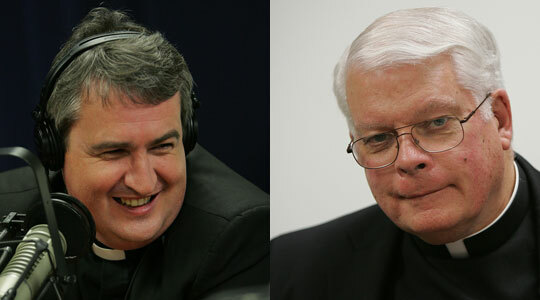 Small said he worked with Cardinal Seán at the bishops’ conference on Latin America and traveled with him to Haiti after the earthquake last year. They recalled together how children used to be asked to save pennies for “pagan babies”, as a way to help them. Fr. Small points out that some of them grew up to be priests, nuns, and lay catechists and still need our help today as the pillars of Catholic communities in mission lands. Scot said it wasn’t just about conversion but about helping them because they were in need. Fr. Copp said today they still do this work in the Holy Childhood Association, educating children about kids like themselves in need around the world. Fr. Small said we can’t take for granted that Jesus will be proclaimed in every age. We have to do our part, like our parents and grandparents did. We should claim our heritage in the good will caring for others, person to person, a world away. Fr. Copp said he hopes on World Mission Sunday to equal or exceed the $450,00 collected last year in Boston.